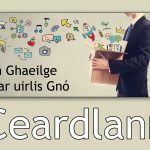 Glór na nGael is supporting Líonra Leitir Ceanainn in their strategy to have Leitir Ceanainn / Letterkenny recognised as a ‘Baile Seirbhíse Gaeltachta’ (BSG) – a Gaeltacht Service Town. A central part of a BSG is that people can do their business in the Irish language and not be obliged to turn to English. In Glór na nGael we understand the importance of such a service, not only to the local Irish speaking population but in particular to the Gaeltacht population who are regular and important customers of shops and businesses in the town. We also understand that support and advice is needed by local businesses who have set the goal to use the Irish language to their advantage. This is why a free workshop aimed at businesses and the self employed is being organised on September 11 from 18.00 – 20.00 in the Donegal County Council offices in Leitir Ceanainn / Letterkenny.